What is Wellness Super5Mix Large Breed Adult Dry Dog Food? 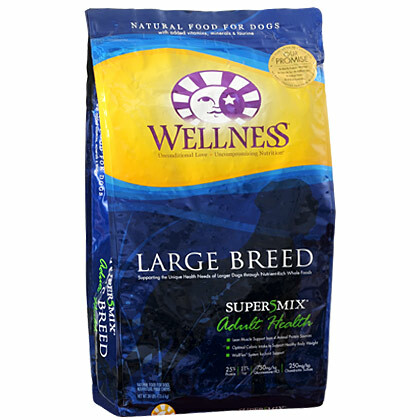 Wellness Super5Mix Large Breed Adult Dry Dog Food is specially formulated for large breed dogs who weigh at least 50 lbs. It contains protein-filled meats such as deboned chicken, deboned whitefish and chicken meal, while also providing a rich source of carbohydrates from oatmeal, ground brown rice and ground barley - all of which are great substitutes for dogs who may have allergies to corn. It also contains glucosamine and chondroitin, which is what many large breed dogs need to maintain healthy joints. Large breed dogs need good sources of protein to keep their bodies lean and fit so extra weight doesn't put strain on their joints. Wellness Super5Mix Large Breed Adult Dry Dog Food contains a nice 25% protein with the majority coming from natural meat products. It also contains a mix of grains, one being ground brown rice, which is low-allergenic and therefore may be suitable for dogs with grain allergies. Rice is also a good source of protein. Another grain used is oatmeal, which is a good source of vitamin B and carbohydrates. The contribution of flaxseed in the Super5Mix provides Omega-3 and Omega-6 which are essential fatty acids and help maintain healthy skin and coat. Lastly, it contains glucosamine and chondroitin to help promote healthy joints in large breed dogs. 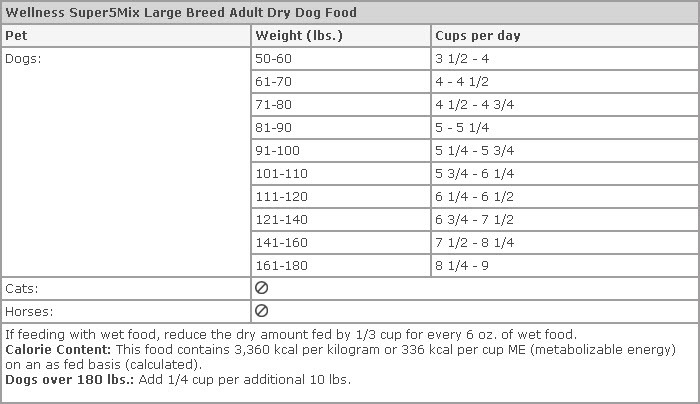 Feed to adult, large breed dogs, who weigh at least 50 lbs or more. Slowly transition your dog from his or her current diet to their new food. Mix your dog's old food and Wellness Super5Mix Large Breed Adult together over a period of 5-7 days, and gradually increase the amount of new food daily so that by day 7 your dog is eating 100% new food. Ingredients: Deboned chicken, deboned whitefish, chicken meal, oatmeal, ground peas, ground barley, ground brown rice, tomato pomace, salmon meal, chicken fat (preserved in mixed tocopherols, a natural source of vitamin E), tomatoes, natural chicken flavor, ground flaxseed, carrots, spinach, sweet potatoes, apples, blueberries, vitamins [beta-carotene, vitamin E supplements, ascorbic acid (vitamin C), vitamin A supplement, niacin, d-Calcium pantothenate, riboflavin, vitamin D-3 supplement, pyridoxine hydrochloride, thiamine mononitrate, folic acid, biotin, vitamin B12 supplement], minerals [zinc sulfate, zinc proteinate, iron proteinate, ferrous sulfate, copper proteinate, copper sulfate, manganese proteinate, manganese sulfate, sodium selenite], glucosamine hydrochloride, chondroitin sulfate, choline chloride, taurine, chicory root extract, yucca schidigera extract, mixed tocopherols (a natural preservative), dried lactobacillus plantarum, enterococcus faecium, lactobacillus casei, lactobacillus acidophilus fermentation products, rosemary extract.